Recapping for our new members, several months ago the FASF made the final payment on the original 60-acre tract that it had purchased in 2009. That tract contains part, but not all, of the landing field that the First Aero Squadron used during the 1916-17 Punitive Expedition against Pancho Villa and his revolutionaries. The 60 acres also includes most of the old Columbus Municipal Airport. The rest of the First Aero Squadron landing field and flight line (as well as part of the Columbus Municipal Airport runways) was located on an adjacent 160-acre parcel owned by a private party. By coincidence, that parcel was put up for sale just as the FASF finalized its purchase of the 60-acre tract. 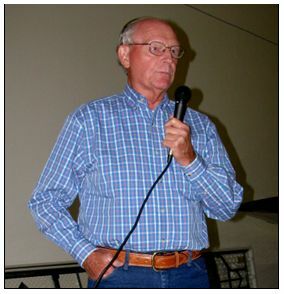 Because the FASF was not in a position to purchase the 160 acres, President Bill Wehner and his wife Mary purchased it out of their own resources and announced their intention to deed it to the FASF at cost once the organization reimbursed them for the amount they pulled out of their own retirement fund to make the purchase. Suzanne S. Azar, El Paso, TX. Please help preserve a key event—the first use of US army airplanes in military combat operations—and its associated historical site by “buying an acre” for the FASF. 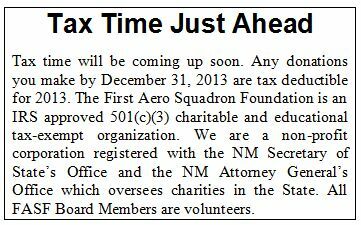 To buy an acre, send a check for $250 to the First Aero Squadron Foundation, PO Box 1516, Columbus, NM 88029. If you would like to make your donation in honor of a person, just let us know and the plaque will contain both your name and the designee you wish to honor. The FASF is also accepting partial acre purchases as follows: ½ acre: $125; ¼ acre: $62.50; and 1/10 acre: $25.Those purchasing partial acres will also have their names (and person you are honoring, if any) inscribed on the plaque. Thank you all for your encouragement, support and generosity. Welcome to all our new members! You can become a member by filling out an application form which you can download and print from the FASF website: www.firstaerosquadron.com. Or call, email or write me, Gene Valdes, and I will mail you a form (phone: 505-660-1112, adolfostr@aol.com or write me at the FASF address, PO Box 1516, Columbus NM 88029). Regular Membership Dues are $20 a year ($10 for students and active military). New members receive an official First Aero Squadron patch; a First Aero Squadron decal; a subscription to the FASF newsletter The Aerodrome; the right to vote (and run for, if you are so inclined) for the FASF Board of Trustees; the use of the restored historic runway (at your own risk); and an invitation to all FASF-sponsored events and educational presentations. A local Board Member will also be happy to give you a personally guided tour of the historic site. 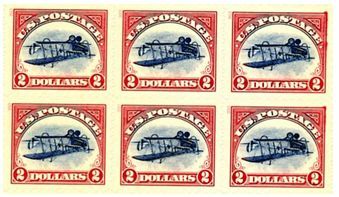 Ninety-five years ago on May 10, 1918, the US Post Office issued a 24¢ postage stamp inadvertently depicting an upside down image of the Curtiss JN-4 airplane. Just one sheet of 100 of these stamps was sold before the error was caught. The printing mistake made the inverted Jenny stamp one of the rarest and most valuable of US stamps. A single inverted Jenny stamp sold at an auction in 2007 for $977,500. A block of 4 of the stamps sold at a 2005 auction for $2.7 million. In commemoration of this famous mistake, the Post Office has just issued a collector’s packet containing 6 of the inverted Jennys, each with a face value of $2, for $12. They might make a nice gift for an aviation-minded family member or friend. The First Aero Squadron (FASF) is seeking an enterprising individual with non-profit management background to assist the Board of Directors in developing a long range master plan designed to further our mission. Initially, the volunteer Managing Associate position will be a part time, self directed, flexible position for approximately a nine month period. An evaluation of the position will be conducted at that time to assess the development efforts initiated for possible consideration of a future, continued, paid, part time commitment. The position would require an occasional presence in Columbus on a flexible schedule to meet with the Board and review progress. A short-term housing apartment is available for any overnight meetings. The FASF will work with educational institutions in documenting the experience of any student doing this for degree credit. Responsibilities include investigating fundraising options, grant research and preparation, event planning and community engagement, and marketing the public profile of FASF within other organizations aligned with the FASF mission. The individual should be a self starter, be familiar with the grant writing process, have strong written and verbal communication skills, and be willing to work with the FASF team. The First Aero Squadron is a non-profit 501(c)(3) foundation with rich, historic ties to New Mexico aviation history including the Pancho Villa Raid in 1916 involving the American military and the Curtiss “Jenny” biplane – https://firstaerosquadron.com/ . Our mission is to secure, preserve and restore the historic 1916 Aerodrome in Columbus and have already secured land, graded a 2,600 foot runway on the site of the original Columbus Municipal Airport, and are month by month increasing our membership base. 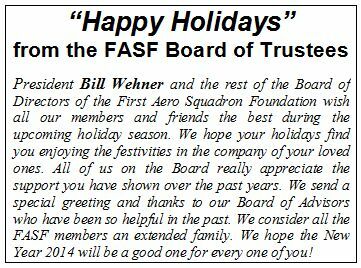 Please submit a letter of interest and resume to FASF email: info@firstaerosquadron.com For further details, contact Bill Wehner at (575) 531-7044 or by email to wehner@vtc.net. The above wings were donated to the FASF by Diane Patton, a volunteer at the Deming Visitor’s Center. She, in turn, was given them by Brian Houltin, son of the late Marty Houltin who headed the infamous Columbus Air Force. The latter was a nickname for a group of pilots involved in smuggling marijuana to the US in the 1960s and early 1970s. The above emblem is not a First Aero Squadron emblem. It’s probably a pre-World War II emblem. Can you help identify it for us? Thanks! Ric Lambart, current FASF Board Member and 1st Vice-President who will be running for reelection to one of the vacancies. Ric is a graduate of Columbia University who became a pilot in 1944 and has over 13,000 hours in the air. Lew Stratton, a former college professor with a Doctorate in Chemistry/Biochemistry. who taught at Furman University, South Carolina from 1967-2000. Paulino “Sonny” Villegas, a teacher with the Deming School District who has a double Master’s Degree from the College of Santa Fe. Kathleen Martin, a cultural anthropologist with a Ph.D. from Bryn Mawr College and whose grandfather served as a soldier in the Punitive Expedition. Nominations for candidacy to the FASF Board will close on December 1st. If you are interested in running for a position on the Board, please notify Elections Committee Chair Gene Valdes before the closing date (505-660-1112 or adolfostr@aol.com). Ballots will be sent out in December and counted in January. John L. Deuble Jr., an Environmental Scientist and Engineer, is also an author and historian who has become an expert in New Mexico history. John, who is a member of the FASF Advisory Board, has graciously given the FASF exclusive permission to publish articles from his upcoming books in The Aerodrome. The two books awaiting publication are Camp Furlong – Columbus, New Mexico 1912-1926 and The First Aero Squadron 1913-2013 – A Century of Military Aviation Leadership and Service. John’s articles are authoritative, fully documented and make fascinating reading for anyone interested in the beginnings of American Air Power and the response to Pancho Villa’s 1916 incursion. Upcoming issues of The Aerodrome will feature John’s scholarly yet eminently readable articles.